Stay indoors if possible when snow and ice accumulates. If a snow or ice storm strikes during the overnight hours, try to alter your morning schedule. Don’t hurry of to work or school before plowing has been completed. Walk slowly and use railings when available during icy weather. If there is no railing, try walking in the snow instead of directly over icy patches on sidewalks, driveways, parking lots and streets. If you must go out in the ice and snow where boots with good traction to help you walk safely. Be alert for “black ice” on driveways, porches, sidewalks and streets. 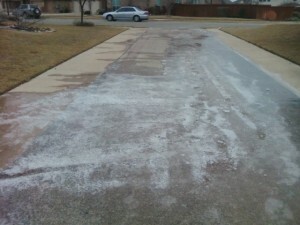 This is a thin layer of invisible ice that can form on concrete and other flat surfaces. You may think the sidewalk or driveway is clear and then step on black ice and slip. Check for black ice on walking surfaces and pavement if you see or know there was precipitation while experiencing freezing temperatures. The fall and winter holiday season is quickly approaching. It is a time when homes are filled with neatly decorated trees, twinkling lights, tasty meals and treats, festive decorations and family members and friends. All of us expect this combination to yield happy memories and good times for all, but it also poses a huge risk. For instance, the US Fire Administration reports structure fires increase during the winter holidays and the dollar loss per fire is 34% greater than normal. There are numerous safety tips and informational articles available to help keep your family and home safe throughout the fall and winter holidays. Take some time to review this helpful information, so your Thanksgiving and Christmas holidays are enjoyable and memorable for all.